To some people, carrying on the legacy and contributions your family has brought to the community for generations is important. To not only continue the traditions, but also the work of your parents and their parents (and their parents) can be you the subject of an admirable and heartwarming tale. On the other side of the spectrum, there is the celebration of bringing in something new and fresh to the equation, though preferably with a healthy respect for what previous generations have accomplished. Taking a new turn often works best for some generations, and can also lead to an admirable and heartwarming story. As the son of doctors who spends his days studying books and games, I clearly fall into the latter category. However, not every family’s story is so clear-cut between one or the other, as is the case with the Levines. Cover photo from J. Levine’s Facebook page, featuring Danny Levine (left), Shawn Levine (middle), and Seymour Levine (right). For the family behind J. Levine Books and Judaica, this is a story spanning 125 years. With the tale beginning with a Torah supplier named Hirsh Lany in Lithuania, it becomes clear that quite a lot has changed in that time. Nevertheless, each generation following his arrival to America never strayed too far from their roots, sticking with the family business while gradually transforming it into the bookstore we all know and love today. This could place their heartwarming tale close to the fence on what type of story it is, but I would still say they stand firmly on the side of legacy. In spite of the changes and adaptations over the generations, J. Levine has always been a bookstore dedicated to the current needs for each generation of the Jewish community. Key moments in this bookstore’s evolution can be seen below. J. Levine Books & Judaica History on Dipity. Yes, I said “evolution.” Each point on this timeline depicts a moment in which the bookstore adapted itself to better fit the needs of the community. Laura Miller refers to community as “social bonds based on affective ties and mutual support” (119), and if the story of Lany and the Levines is any indication, nothing could be more important to their business than this idea of community. This is evident in the company’s first transformation from Lithuanian to American. While the Jewish community was dying out in Lithuania, it was growing in Manhattan’s Lower East Side. Lany simply followed to where he could continue to serve in mutual support for the community. The Levines display the works of professionals from throughout the community. Though none of the future changes or decisions were as drastic or urgent as what Lany had to do, each generation followed in his footsteps and continued to alter the function of the bookstore as time went on. When their times came to take charge of the family business, Joseph and Seymour both looked to the community (though this is much more obvious in Seymour’s case). These adaptations are similar to trends Miller noted in other bookstores, which expanded the nature of their businesses to include services and goods beyond bookselling. It wouldn’t be until Danny’s run of the store when we would see additions such as Batman-inspired Judaica and Zionist Action Figures, but for their part, Joseph and Seymour’s expansions greatly altered the initially narrow function of J. Levine into something that would continue to contribute to an ever-evolving customer base and community. J. Levine continues to evolve, keeping up with the digital age with their website allowing for online orders and assistance to members of the global community. However, appeasing the global community is only part of the picture. J. Levine’s success is owed to how the company has coexisted with the local community. As it turns out, the Lower East Side was the perfect place for a Jewish bookstore to set up shop. According to an old (and admittedly biased) article from The Outlook, the Jewish community of the Lower East Side was obsessed with Yiddish literature. Nowhere else had the author seen such a collection of cooperating bookstores (though their cooperation may not have quite as close to the level of “trust-evil” as he implied). Though flawed in its portrayal of the community, the article does get at the spirit of a neighborhood that showed tremendous support for endeavors in knowledge and culture such as the bookstore. Of course, this support was mutual. While the customers in the community hungered for Yiddish texts (and other Jewish goods), the salesmen were ready to sate that appetite with the right book. Wanting to have the right books for regulars in the community is not an uncommon trait for independent bookstores, and has been a sentiment shared by various owners, such as Madge Jenison of Sunwise Turn. Just as each generation behind J. Levine had been ready to adapt to the needs of the community as a whole, so too were they capable in satisfying individuals within the community. 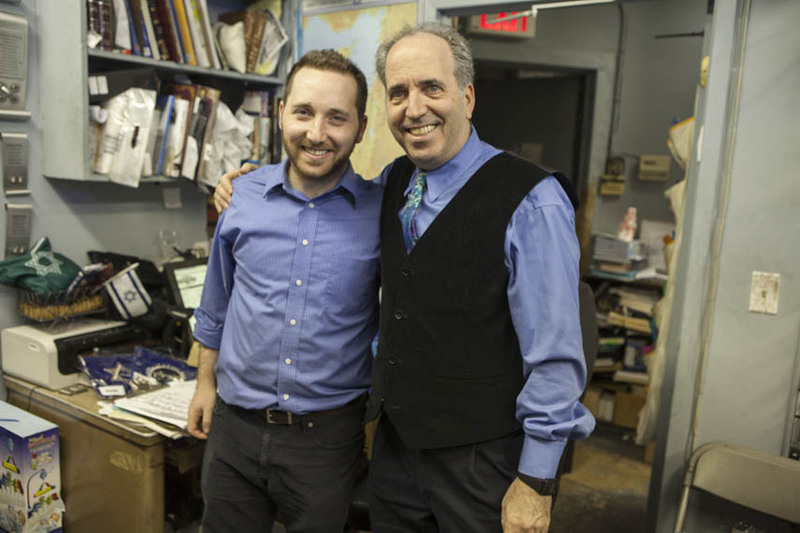 Danny attributes the success of J. Levine to the dedication of booksellers such as Rabbi Philip Kastel, who knew their full stock of books just as well as he knew every one of their customers during his time as a manager, just as much as he does to his family’s ability to adapt. Such dedication to the community has been the central theme of J. Levine’s story for five generations, and it shows no sign of changing. The family legacy of the Levines is not just the bookstore, but also their devotion to the community. This dedication has taken different forms with each generation as the store evolved, but each turn and variation was each son’s take on fulfilling their fathers’ legacy. I might not be the most qualified to tell you what this story all means in the end, since the responsibilities I’ll be taking up in life are wildly different from my father’s. For that, you should read the anecdote in this article about Seymour. You might find what he says to be admirable and heartwarming. Jenison, Madge. Sunwise Turn: A Human Comedy of Bookselling. New York City: E.P. Dutton & Company, 1923. “Jewish Bookstores of the Old East Side.” The Book Peddler Summer 1992, 20-23. Miller, Lauren J. Reluctant Capitalists. Chicago, IL: The University of Chicago Press, 2007.